Poaching and fish theft are of increasing concern to anglers and in addressing this issue the Angling Trust has achieved support from the Association of Chief Police Officers and National Wildlife Crime Unit. Currently Project Trespass aims to provide a coordinated response to poaching and raise awareness of this issue amongst police forces. Under the umbrella of Project Trespass, Lincolnshire and Cambridgeshire Police - in partnership with the Angling Trust, Environment Agency (EA) and Fish Health Inspectorate (FHI) - are launching Operation TRAVERSE to target illegal fishing and fish theft in Fenland. One problem in this part of England - historically famous for predator fishing in winter - is the issue of migrant anglers from Eastern Europe sometimes not understanding British angling law and our conservation-based approach to angling. Here, National Byelaws limit the size and numbers of fish that can be retained, and removing fish from enclosed waters without the owner's consent is theft. To help deal with this problem the Angling Trust's 'Building Bridges Project' aims to educate and integrate migrant anglers. In June 2014 key Angling Trust enforcement staff visited Poland and forged a partnership with its PSR government fisheries department and voluntary fisheries enforcement organisations. As a result of this visit, information is now passed to the British authorities about those prosecuted in Poland who are likely to travel to England and details of offenders here are provided to the PSR. This process and exchange of information has now been adopted by other Eastern European countries. As part of their participation in Operation TRAVERSE and the sharing of best practice and intelligence, PSR officers are meeting with British enforcement partners this month. Press are invited to meet participating PSR officers, Police, EA, FHI, Angling Trust staff and other partners at Lincolnshire Police Headquarters, LN2 2LT at 12 mid-day on Wednesday 12 November 2014. A PDF map can be found HERE. Angling Trust National Enforcement Manager, Dilip Sarkar MBE, said: 'This is a really important operation aimed at raising awareness of this serious issue and emphasising the partnership approach now being taken. It is essential that anglers contribute to this process by reporting incidents and information to the police on 101 or EA on 0800 80 70 60, quoting Operation TRAVERSE. The Fenland 'River Watch' initiative has a key role to play in this process and we commend those involved for their ongoing efforts and support'. Sergeant Dave Robinson of Lincolnshire Police said: 'Poaching fits within the much bigger picture of Rural & Wildlife Crime, which we are keen to address, not least because of the wider criminality frequently involved and the negative impact upon livelihoods. We very much welcome therefore, the opportunity to play a key role in TRAVERSE and work with all our partners to achieve the required result through raising awareness, education and positive enforcement'. Adrian Saunders, EA Fisheries Enforcement Campaigns Manager, said: 'We fully support TRAVERSE and look forward to this multi-agency approach - and especially to meeting and sharing Best Practice with the PSR'. Angling Trust 'Building Bridges' Project Manager, Rado Papiewski, said: 'We are most grateful not only to the police, EA and FHI but equally the PSR, for travelling to England and assisting us. We hope that this will increase awareness throughout the migrant community of the severity of this issue, and help educate more migrant anglers regarding the law and catch and release rules and culture'. Jon Hulland from Cefas FHI said: 'We also welcome TRAVERSE, which provides an excellent opportunity to raise awareness and address this issue through all-important partnership working'. Pike Anglers' Club Chairman and Angling Trust Ambassador Neville Fickling said: 'This has been an ongoing problem for some time, and we are delighted to see that some joined up thinking and working will now help address it. Reporting incidents is clearly crucial to the success of TRAVERSE and I would urge anglers and the public to report incidents and information accordingly'. The strength of feeling on this subject has once again been illustrated in the Angling Trust's current angling survey, which is still open until October 31st, and in regular representations to both the Trust and carp fishing magazines and organisations. The Angling Trust believes that the current arrangements need to change as they don't seem fair to carp and other specimen anglers using three rods, but being charged for four. On the other hand any changes must not reduce the funds available to the EA for the restocking of waters, tackling fish health issues and delivering fisheries improvement and habitat restoration works, particularly at a time when the government is cutting grant funding to the Agency. Nigel has been a sea, coarse and game angler for more than 50 years, and a life member of the ACA/Angling Trust for nearly 30 years, serving on the ACA Council from 1989 to 1996. He has written for a variety of angling publications, both print and online, and contributed to Merlin Unwin’s 'The One that Got Away'. A species identified by the Government as one of the most destructive invasive non-native species has been found at Wraysbury Reservoir and in the nearby River Colne system, a tributary of the River Thames. Known to alter whole freshwater ecosystems, a mature adult can filter one or more litres of water a day, feeding on zooplankton which is the base of the food chain that all fish need to survive on and produce 1 million eggs in one season, so they can spread very rapidly. Quagga mussels (scientific name Dreissena bugensis) originate from the Caspian and Black Sea region which is the same part of the world as the Killer Shrimp and the Demon Shrimp which both arrived in the UK over the last 4 years. The rapid breeding of the Quagga results in large numbers being established very quickly and has caused extensive damage in the areas it has already reached; The Great Lakes, Mississippi & Ohio rivers in America, Main river in Germany, the Netherlands and the Volga river in Russia. Quagga mussels also have an impact on water supply and sewage infrastructure, canal lock gates, boat propellors and any other hard surfaces. The EU Invasive Alien Species Regulation was approved finally by the European Council on Monday 29 September, which will require Member States to take action to prevent and eradicate invasive alien species of most concern. The Angling Trust will be lobbying the UK government to ensure that these types of species are included in the lists. Senior Angling Trust staff are busy doing the rounds of party political conferences to make sure that the voice of angling is communicated right to the top of the British political system. The Trust has jointly organised, with the British Association for Shooting and Conservation (BASC), three ‘rural receptions’ at the Conservative party conference in Birmingham, at Labour’s Manchester gathering and with the Liberal Democrats in Glasgow. More than 300 conference delegates, ranging from local councillors to government Ministers, will be attending the events. The Labour reception was addressed by their new Shadow Fisheries Minister Angela Smith MP who reconfirmed her party’s strong support for angling. Liz Truss, the new Environment Secretary, spoke at the Conservative event and highlighted the economic importance of both angling and shooting. She heard Angling Trust Chief Executive Mark Lloyd spell out some of the challenges facing angling and fisheries and in particular the urgent need for conservation measures to halt the worrying decline in bass and salmon stocks and for meaningful action to tackle over abstraction and agricultural pollution. Martin Salter, National Campaign Coordinator for the Angling Trust and a former Labour MP, was in Birmingham where he lobbied David Cameron personally on the issue of bass conservation and held meetings with other wildlife groups keen to work with the Trust on seeking better protection for estuaries. Mark Owen, Head of Freshwater, spoke at the Labour reception with Bob Younger from Fish legal Scotland set to join the LibDems in Glasgow. A special political briefing on key issues affecting angling and fisheries was circulated to party delegates and MPs. The Angling Trust has cranked up the pressure to save the UK's threatened bass stocks with a hard hitting briefing calling for immediate parliamentary action which is being sent to all MPs this week. The Westminster Bass Briefing has been jointly produced by Angling Trust Campaigns Chief Martin Salter and Marine Campaigns Manager David Mitchell. It follows on from last week's letter to UK Fisheries Minister George Eustice calling on him to introduce a series of conservation measures to protect UK bass stocks in the face of latest scientific advice from ICES, which has recommended a staggering 80 per cent cut in catches in order to protect the future of the species. Publishing the findings of the review, commissioned in 2012 by Richard Benyon, into the evidence supporting an increase in the minimum landing size for bass. Strengthen and enforce the UK's network of bass nursery areas. 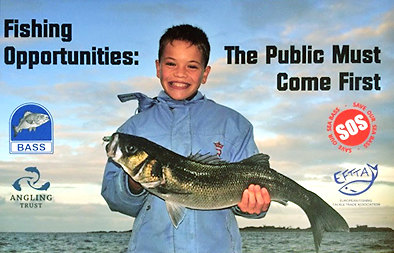 Support the UK-wide voluntary code of conduct for recreational angling. Ensure that bass policies are formed on the basis of science and evidence and not commercial pressure. 'These new figures should seriously worry anyone with a stake in the future of bass fishing in this country, Whether you're a commercial fisherman or just someone who fishes for fun, we all want the same thing: bass in the sea to catch. These figures paint a stark picture of a future without these fabulous fish in UK waters unless something changes and changes soon. Angling and conservation groups have given a lukewarm welcome to this week’s Government announcement that National Parks and Areas of Natural Beauty will be afforded special protection and fracking developments will only be allowed within them under ‘exceptional circumstances’. Although a useful step in the right direction this definition remains unclear and will not prohibit all fracking in these areas. Other wildlife sites which often include important fisheries, such as Special Protection Areas (SPAs), Special Areas for Conservation (SACs) and Sites of Scientific Interest (SSSIs) as well as nature reserves and Local Wildlife Sites, have been excluded from the new safeguards. The Angling Trust, National Trust, RSPB, the Salmon and Trout Association, The Wildlife Trusts and the Wildfowl and Wetlands Trust earlier this year published a major review of the risks that shale gas extraction (‘fracking’) could pose in the UK entitled ‘Are we Fit to frack?’ which put forward ten recommendations to address these risks. Avoid sensitive areas for wildlife and water resources by creating shale gas extraction exclusion zones. Make Environmental Impact Assessments (EIA) mandatory for shale gas extraction proposals. Require shale gas operators to pay for a world-class regulatory regime. Prevent taxpayers from bearing the costs of accidental pollution. Ensure monitoring and testing of shale gas operations is rigorous and independent. The Angling Trust shares the concerns of other wildlife groups about the impacts of fracking and the potential for water contamination, close to a range of fragile ecosystems and habitats including vulnerable chalk streams. With many of the newly licensed fracking areas either on top of or close to the chalk aquifers of Southern and Eastern England the Trust has pressed for designating all sensitive areas as ‘no frack’ zones. Groundwater contamination poses a threat to all river systems but the English chalk rivers are particularly vulnerable due to the permeable nature of their aquifers. “This is a missed opportunity to ensure that all designated sites, which are highly sensitive and of great value to wildlife and fisheries, are properly protected from the outset. The Angling Trust has once again joined forces with other conservation groups to strongly urge Government to review this decision and deliver meaningful environmental protection and a rigorous system of regulation.